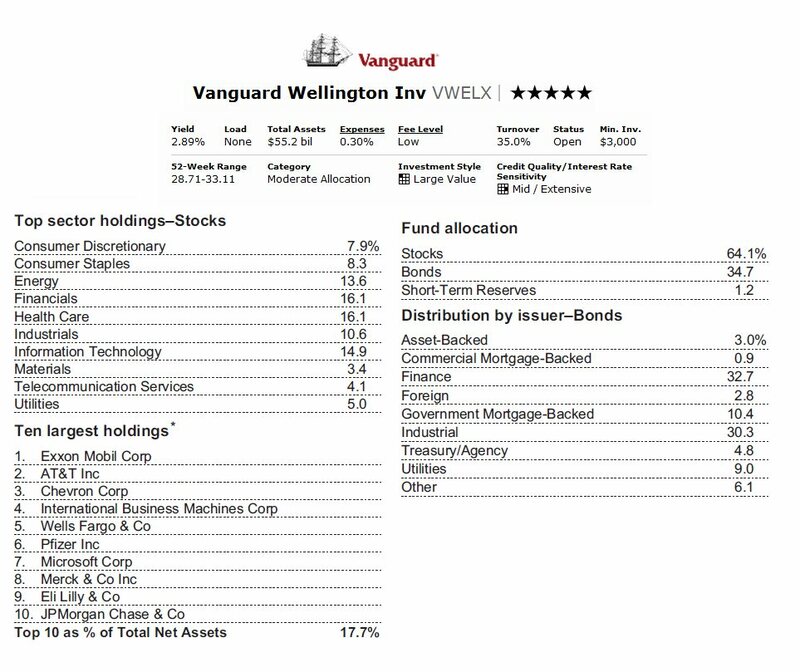 Vanguard Wellington Investor (VWELX) fund is a top rated moderate allocation balanced mutual fund. This Vanguard fund focuses its investment in bonds and stocks. The investment objective of Vanguard Wellington fund is to provide long-term capital appreciation and reasonable current income. This equity fund invests about 60%-70% of its assets in dividend-paying and, to a lesser extent, non-dividend-paying common stocks of established, mid and large companies. Most of these stocks are known as value stocks. It invests the rest of assets (30%-40%) of the assets in fixed income securities that the advisor believes will generate a reasonable level of current income. These securities include investment-grade corporate bonds, U.S. Treasury and government agency bonds, and mortgage-backed securities. This Vanguard Wellington Fund has been in the market for around 82 years (since 1929). Currently, it is under the management of Edward P. Bousa. He has been managing this fund since December 2000. This fund has total net assets of $55.24 billion. The fund's dividend yield is 2.89% and the latest dividend received by its investors in September 2011 ($0.11). The fund has annual expense ratio of 0.30%. This figure is good enough, as the average expense ratio in the Moderate Allocation category is 1.03%. This top rated balanced fund charges no 12b1 fee and no front end sales load fee. The minimum initial investment is $3,000 with $100 minimum subsequent investment. This applies for both brokerage and IRA account. This fund can be purchased from 82 brokerages including Royal Alliance, Schwab Retail, Ameriprise Brokerage, Vanguard NTF, T Rowe Price, JP Morgan, E Trade Financial, Fidelity Retail Funds Network, etc. The other class besides this Investor Shares is Admiral Shares (VWENX). This fund allocation as of September 30, 2011 is 64.1% in stocks, 34.7% in bonds and 1.2% in short-term reserves. The top 10 largest holdings are Exxon Mobil Corp, AT&T Inc, Chevron Corp, IBM Corp, Wells Fargo & Co, Pfizer Inc, Microsoft Corp, Merck & Co Inc, Eli Lilly & Co and JP Morgan Chase & Co. These top ten represents 17.7% total net assets. The top sectors holdings-Stocks are Financials (16.1%), Health Care (16.1%), Information Technology (14.9%), Energy (13.6%), Industrials (10.6%), Consumer Stapes (8.3%), Consumer Discretionary (7.9%), Utilities (5.0%), Telecommunication Services (4.1%) and Materials (3.4%). According to the fund’s prospectus, the investment risk includes stock market risk, investment style risk, interest rate risk, income risk, credit risk, call risk, management risk, etc. Vanguard is not only known with its index funds, it also offers various actively managed mutual funds. Some of these mutual funds are among the popular and top rated fund in its category such as Vanguard Wellesley Income, Vanguard Wellington, Vanguard STAR fund, Vanguard Windsor, and more. 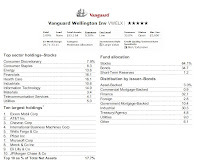 This article will provide review about Vanguard Wellington. This fund is part of balanced fund or hybrid fund which invests in stocks and bonds. This Vanguard Wellington Fund (VWELX) is part of Kiplinger's 25 best mutual funds.